Well, here we are in a new year. We hope that you all had a wonderful holiday season. Julie and I made it through a crazy cooking season and feel our partnership is even stronger! That’s a plus, isn’t it? We want to take the time to thank all of our clients and friends who have been so supportive of us in this great cooking adventure. We truly love what we do, and we appreciate each and every one of you! As we were looking over the recipes on the blog, we saw that we are heavy on appetizer posts. We think that says we like a good party! We don’t think you can ever have too many appetizers in your recipe file, which is why we have a couple more coming your way. 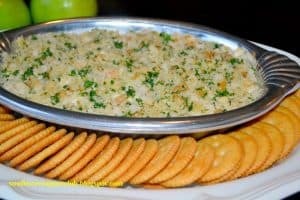 If you are a lover of blue cheese, then do I have a dip for you! It doesn’t have a particularly overpowering blue cheese flavor so even those who aren’t too fond of blue cheese may like it. Tomorrow watch for our second appetizer post that the men in my life can’t seem to get enough of. Melt 2 tablespoons butter in skillet over medium heat. Sauté pecans in butter until toasted. Watch carefully so they don't burn. Place cream cheese, blue cheese, half-n-half, garlic and hot sauce in a medium bowl and beat with a mixer until smooth. Stir in the cooled pecans and the green onions. Mix breadcrumbs with parsley and melted butter. Sprinkle on top of dip in dish. Serve with crackers and apple and pear slices. Cook's notes: My family prefers pecans, but this dip is wonderful with walnuts as well. You can also add 6 to 7 pieces of bacon, cooked crisp and crumbled. Oh my this sounds wonderful. You have my mouth watering and my taste buds wanting a sample, now. Thanks so much! Try it I think you’ll love it!